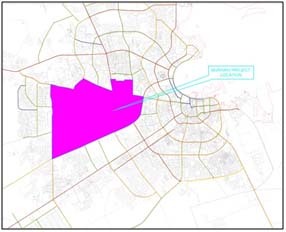 The project area of 2,590 hectares is partially served by a network of existing sewers divided into 9 drainage areas. The project consists of ± 150 KM of foul sewerage piping varying in size between 200 mm and 800 mm, and varying in depth between 2 m to 11 m, including portions to be constructed by micro-tunneling. This project will serve the existing, ongoing and planned developments to the future design horizon of 2035 by extending and upgrading the existing sewerage facilities. 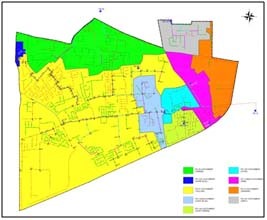 Identify the sewer infrastructure requirements (up to 2035) in accordance with the Ministry of Municipality & Urban Planning (MMUP) latest policy and land use plan; and sizing new facilities based on hydraulic modeling. Integration of new facilities with the existing facilities, while minimizing disruption to existing services. Integration and Coordination of facilities with the design of new road improvements. Other existing Utilities and Infrastructure in the area. Preparation of technical specification, cost estimates and tender documents for the above works. Providing assistance during tendering; technical and financial evaluations of the tender bids. Preliminary study reports and Conceptual Design.